The focus for these searches was primarily on the upper portions of Johnny Lang Canyon, and the cross country area between that spot and the Juniper Flats trailhead parking area. Given what I estimated to be a late start for Bill, the prospect of hiking all the way to the top of Quail Mountain in the heat that day appeared extraordinarily ambitious. It seemed reasonable he could have decided to instead divert to Lang Mine, an easier trip. From my recollection of the initial Ewasko search map, little searching had been done in that area. Further, some maps show a trail leaving the California Riding and Hiking Trail a couple of miles westerly of the Juniper Flats trailhead, a spot Bill is presumed to have passed. In fact, this trail does not exist, and is instead a cross country route. On our very first trip into the area, Pete and I came upon a very large bowl to the southwest of the head of Lang Canyon. In examining the sand wash at its bottom, we saw no trace of any searchers (or anyone, for that matter) having been in it. This gave us encouragement to explore the area further. It was mostly wide open, with occasional large rock piles and large Junipers that could offer someone shelter. From the more easterly portions of the area, the buildings of the Randolph Ranch were obvious and would likely cause someone to head for it. Reasonably well over a period of time. A few smaller areas remained. We, in essence, performed a line search of the rolling terrain between the Juniper Flats trailhead and the head of Johnny Lang Canyon. This was done by recording our routes on our GPSs, then setting new paths to follow, offset from our previous tracks. Thus over several months we covered substantial terrain without going over ground we had previously covered. This technique of establishing search paths, based upon review of previous GPS tracks, was used repeatedly throughout our searching. It allowed us to maximize the ground covered with our limited resources. Of course if the path that was set prior to going into the field didn’t make sense based upon the actual terrain (i.e., a cliff face, boulder field, etc) we adjusted accordingly. Likewise if we saw an interesting area off the pre-plannedsearch path, we diverted to have a look at it. This allowed a small group of people, spread out and connected by radios, to cover a large area over a number of months. An issue to consider for the cross country area is that the possibility of hitting the Serin Drive cell phone tower is remote. There is no line of sight to the tower from that area. However the head of Lang Canyon, especially the bowl noted, had large cliff faces that could act as reflectors. In fact, experimenting with Pete’s Verizon phone in the bowl showed a signal strength of two bars, yet no connection was possible. It appeared the link was being made off a reflection from a large cliff face on the easterly side of Lang Canyon, at its head. This suggested further exploration of the area was warranted. 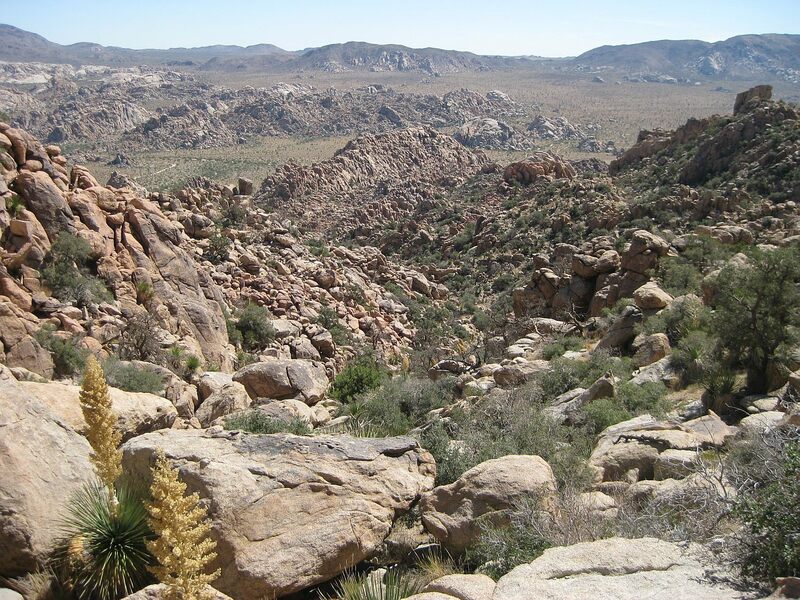 Extremely rugged terrain between Lost Horse Ranger Station and the east crest of Johnny Lang Canyon.